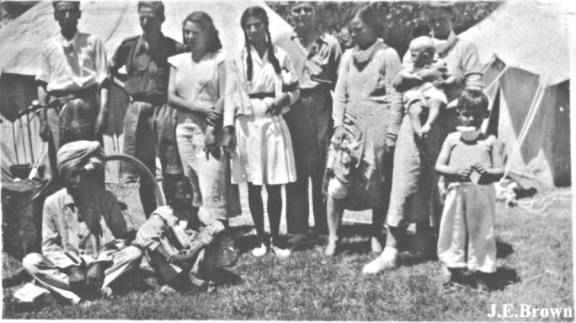 � The photo albums of John Ernest BROWN, which contained photographs by John Ernest BROWN and an unknown photographer who signed his photos as "HIRO". Possibly this was my father as the photos are developed on the same stock as J. E. Brown's photos. 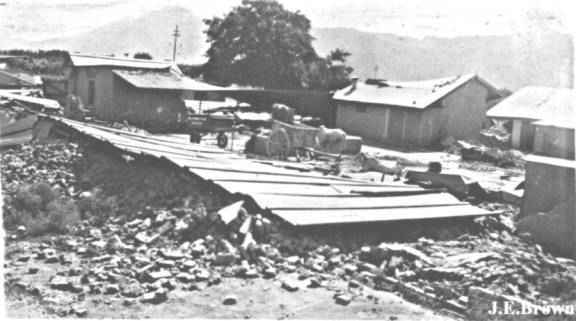 � The Amateur Seismic Centre, whose web site is - http://www.asc-india.org/photo/quettap.htm� They give permission for photographs taken by Harcourt James WALLER, courtesy of his great-granddaughter, Linley Lorenzo, to be reproduced. Also photographs taken by Colin WILTON-DAVIES, courtesy of his son, Colin WILTON-DAVIES to be reproduced. � Each Photograph is identified showing the photographer's name. Quetta is the capital of Baluchistan province. At 5500 feet above sea level it is one of the most important military locations in Pakistan. The borders of Iran and Afghanistan meet here and the Bolan Pass forms an important venue of communication in this region. 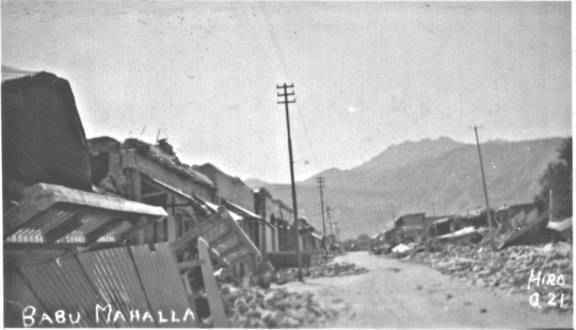 Bruce Street, Quetta, before the earthquake. 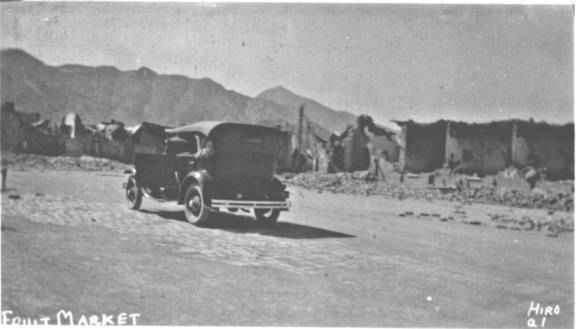 Before the massive earthquake of 31 May 1935, Quetta was a bustling city, with multi-storied buildings. 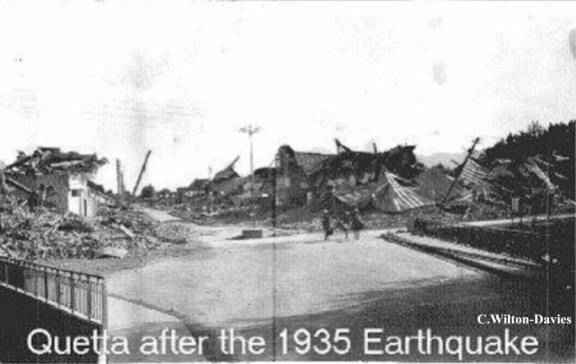 It was almost completely destroyed in this great earthquake and was razed to the ground in the small hours of the morning of that fateful day, when about 30,000 to 40,000 souls perished within a few minutes. 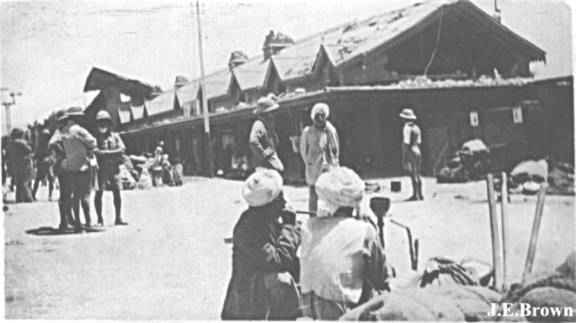 After the great disaster, Quetta houses were generally rebuilt as single level dwellings. The name Quetta is derived from kwatta, meaning fort in Pushto (the regional language). Imposing hills on all sides surround Quetta. These include Chiltan, Takatoo, Mordar and Zarghun. Terrified bus passengers on a mountain road, rush to greet their rescuers after being trapped by fallen rocks following the earthquake. (The bus can just be seen near the centre of the picture). 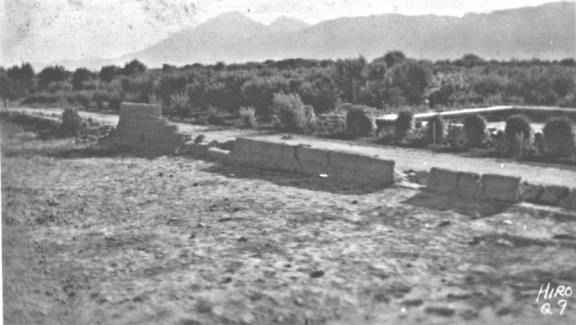 The first westerner to visit Quetta, in 1828, described it as a mud-walled fort surrounded by 300 mud houses. Although occupied briefly by the British during the First Afghan War in 1839, it was not until 1876 that Quetta came under permanent British control and Robert Sandeman was made political agent in Baluchistan. 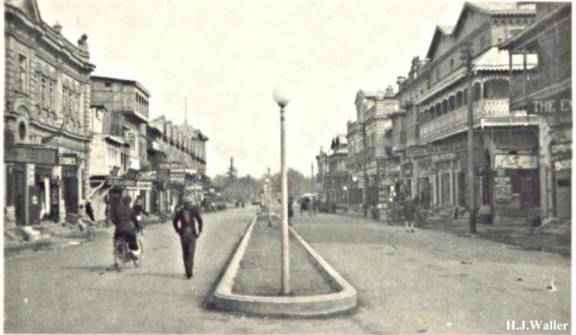 Quetta, was one of the largest cantonments in British India, with a garrison of about 12000 troops. 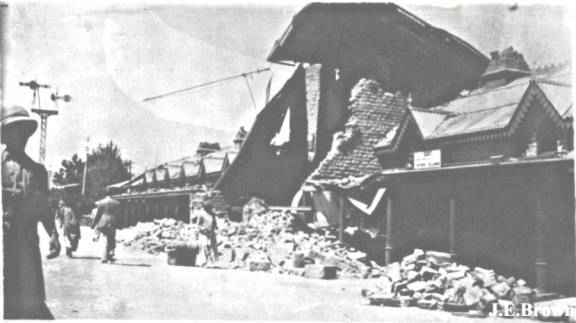 At 3.03 am on 31st May 1935 the city was devastated by a severe earthquake, lasting about thirty seconds, followed by many aftershocks. 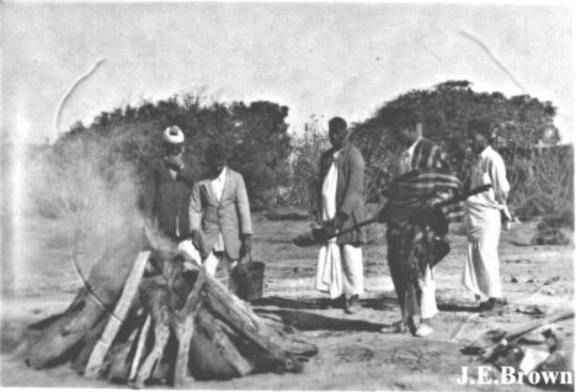 On the night of the earthquake the nearest major unit was the 2nd Divisional Signals, of the Indian Signal Corps, quartered about four miles from the city. The unit, under its CO Lt. Col. W.T Howe. immediately turned out and formed two relief columns, proceeding to the city, and commencing rescue operations. 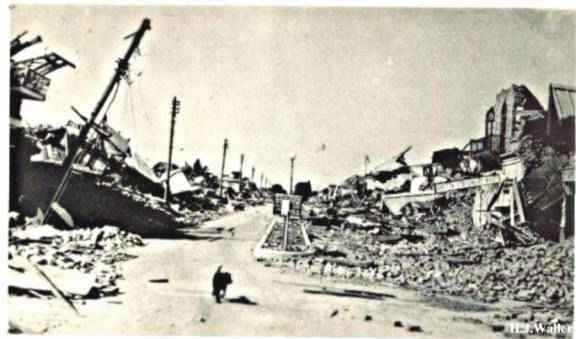 Bruce Road, Quetta, after the earthquake. The road into the city was cleared of rubble. 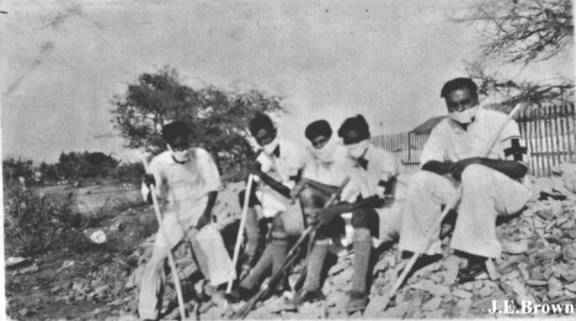 ambulance convoys were organised for transporting the injured to dressing stations, and with civilian guides small parties of soldiers were despatched to aid in digging out victims lying under the ruins of their homes. It soon became apparent that the civilian Posts and Telegraph centre was severely damaged, and the city cut off from the outside world. 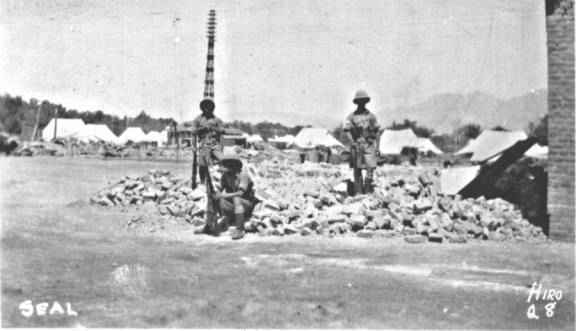 The GOC Quetta District ordered Lt. Col. Howe to withdraw his men from the rescue work, and concentrate on restoring communications. 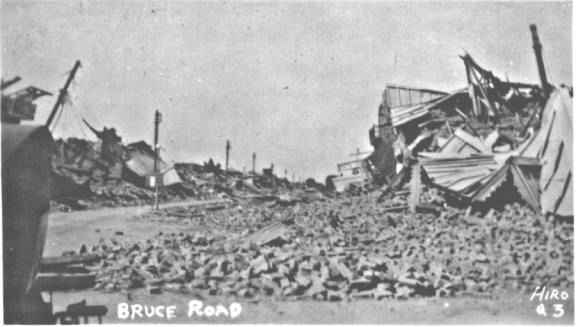 Another view of the devastation in Bruce Road. Lucky to be alive, but unlucky to lose everything, a local inhabitant surveys the ruins of what were homes and businesses. 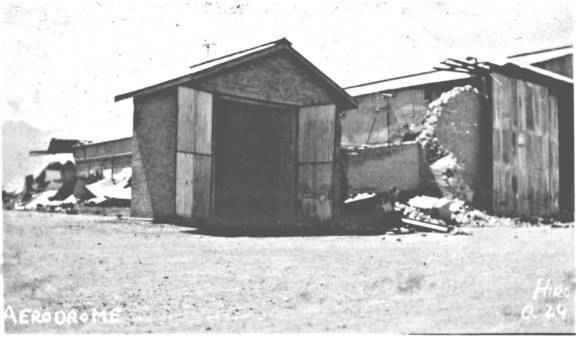 Many buildings were totally destroyed. 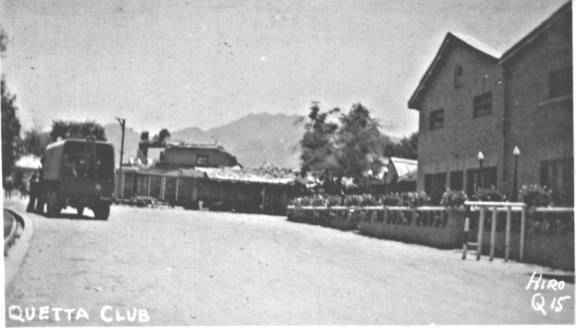 A signal office was established on the lawns of the Quetta Club, and wireless communications were established with Western Command and Army HQ. 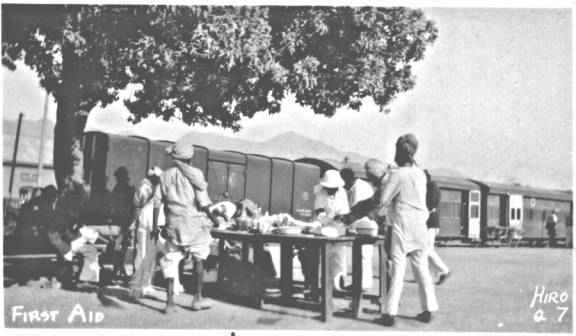 The P & T staff (who had suffered many casualties were assisted with the repair of telephone lines and restoring circuits to Karachi). During the afternoon the GOC spoke on a telephone circuit to the London Evening News for about twenty-five minutes. 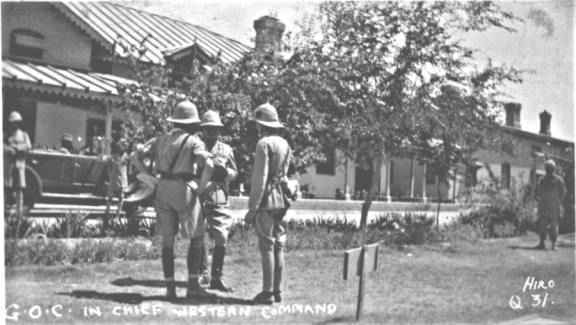 The G.O.C in Chief, Western Command confers with his Officers. At the end of his call to London, he put down the instrument and asked Lt. Col. Howe over. "It puzzles me, Bill," he said with a straight face, "you fix up a line all the way to London and I can hear the fellow at the other end as clearly as I can hear you now. But on a divisional exercise you lay me a line to a spot two fields away and I am damned if I can hear a thing!" By the 10th June it was possible to close the military exchanges and revert to the civil telephone system. Total deaths in the city and surrounding villages were later estimated at 30,000. The Pakistan Information web site gives a figure of 40,000. The scale of the earthquake was recorded as 7.5 on the Richter scale. 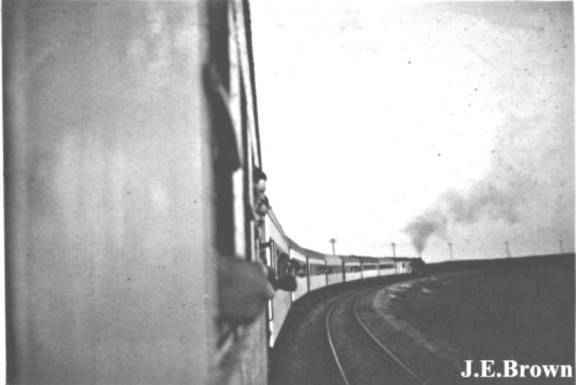 More troops were quickly dispatched by train to help the stricken city. �Passing remote communities on the way. A First Aid unit was set up at the railway station. More views of the railway station. 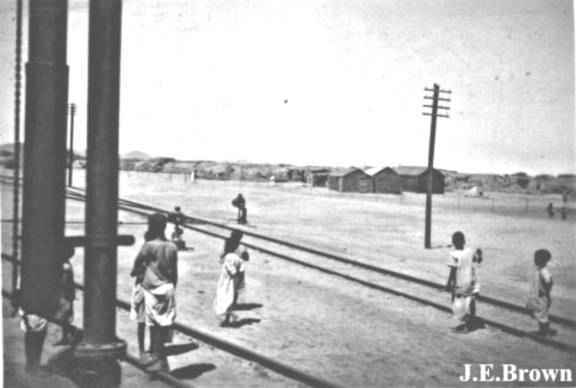 Another view of the Railway Station, which shows some damage, note the signals on the left of the photograph. The walls in this building look very substantial, yet most of the building has collapsed. Some of the staff involved in giving First Aid. After the initial emergency was over the Commander-in-Chief wrote to the Signal Officer-in-Chief as follows: "The work of the Signal Corps in this emergency has been altogether admirable. Without it, I scarcely like to think what might have happened. All soldiers responded to the call, but it was Signals who enabled the work to be co-ordinated and effective. Please tell them how much I admire their work". 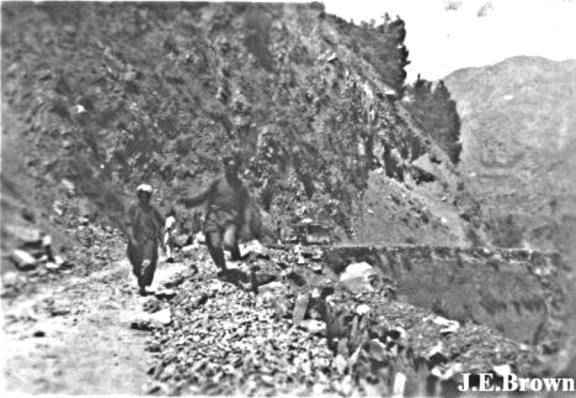 Lt. Col. Howe was awarded the Viceroy's certificate for his service in connection with the earthquake and Lance Naik Gurdit Sing was awarded the Commander-in-Chiefs certificate. 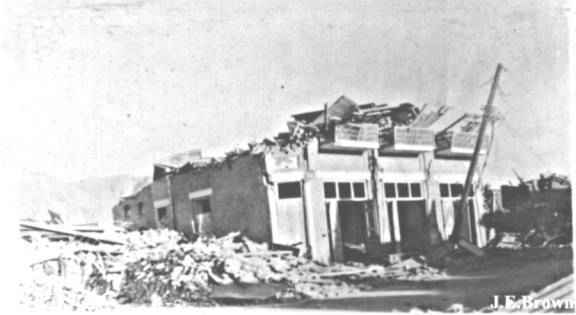 After the great disaster, Quetta houses were generally rebuilt as single level dwellings. 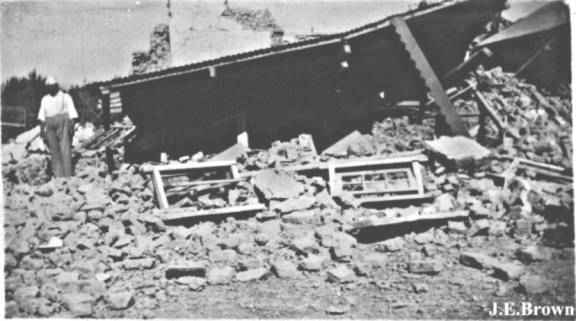 In what became the first building codes for earthquake zones the houses were built with bricks and reinforced concrete. 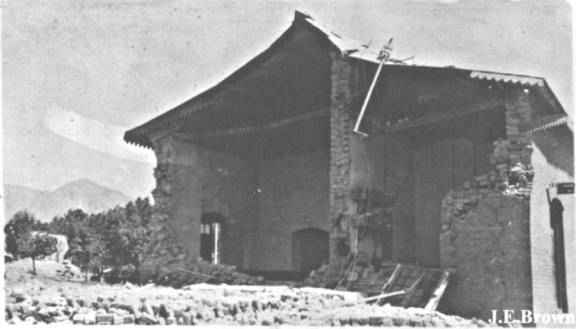 The structures are generally of lighter materials than those that were destroyed in the great earthquake. As the days progress the search for survivors becomes a grim task of searching for decaying bodies. Cremation of human remains becomes a constant task to prevent outbreaks of disease. These two views of the damaged Post Office are similar at the same time of day which leads me to believe that Hiro was J.E.Brown. 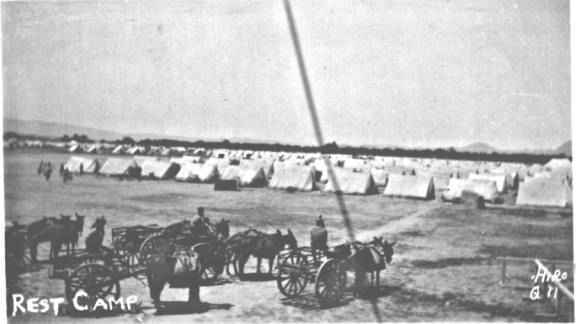 A view of the "Tent City" to house the rescuers and survivors. Note the crack in the original glass negative. British troops not only helped with rescue efforts but also patrolled the city against looters and the maintenance of civil order. 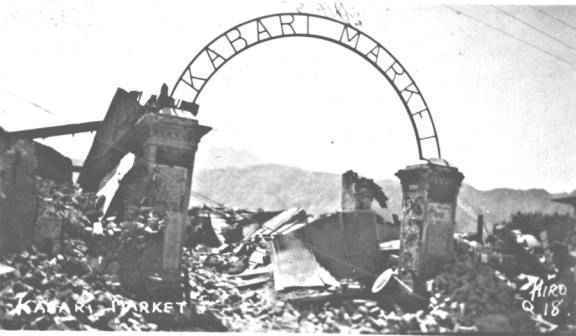 Every city has its markets and this photograph shows the gates of the ruined Kabari Market. 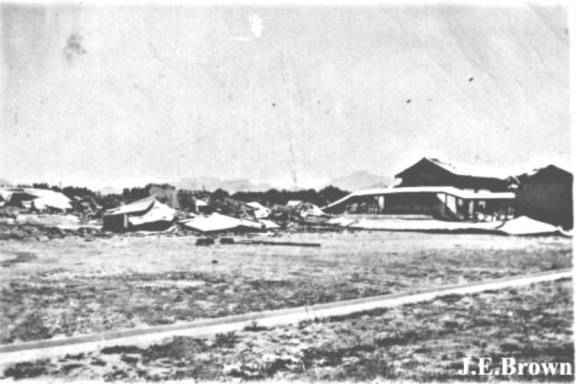 A view of the destroyed Fruit Market. 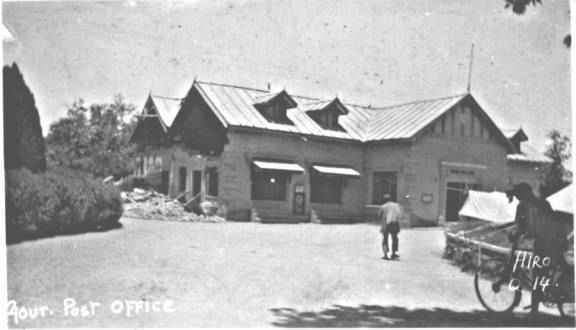 Even in a remote city like Quetta there was a cinema in the 1930's, this one was called the "Opera Talkies". 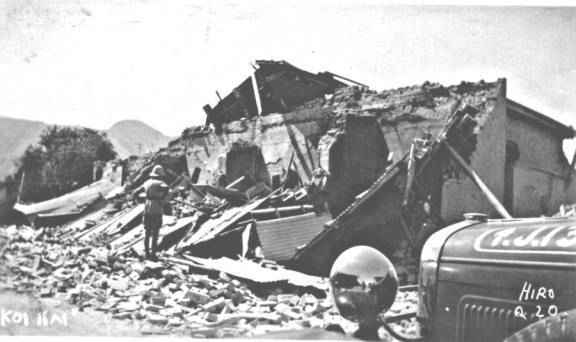 A British Officer surveys the ruins at Koi Kai. Note how the photographer has captured an image in the reflection of the chrome-plated headlight. 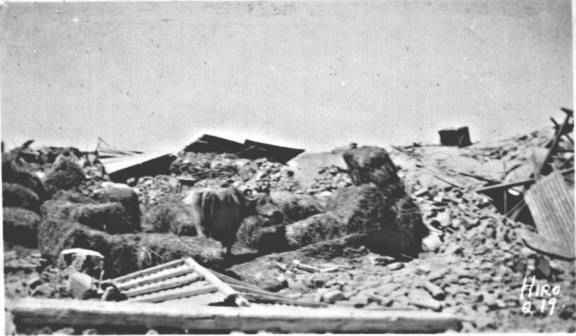 The devastation at Babu Mahalla. 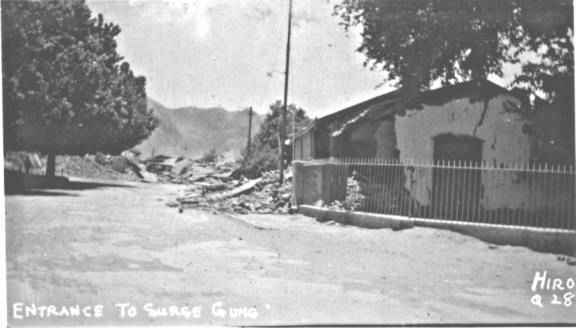 More damage at the entrance to Surge Gung. 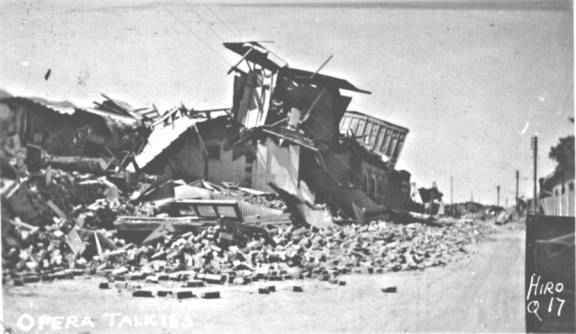 Damage at an unknown location. 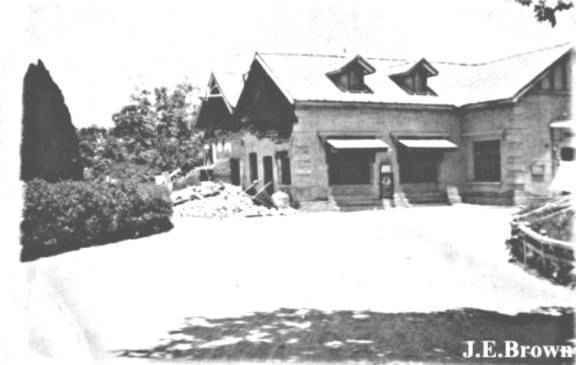 What was once a thriving business, the upper story possibly held the living quarters.